As I think I have mentioned, my husband Tawn reverted to part-time work several months ago in order to return to school. He is studying fashion design, something that has long been an interest of his and he is now exploring whether it could be more than an interest. Family members and friends have been asking what he has been up to in his studies, so now that his semester midterms are over, he has graciously given me permission to share his progress with all of you. 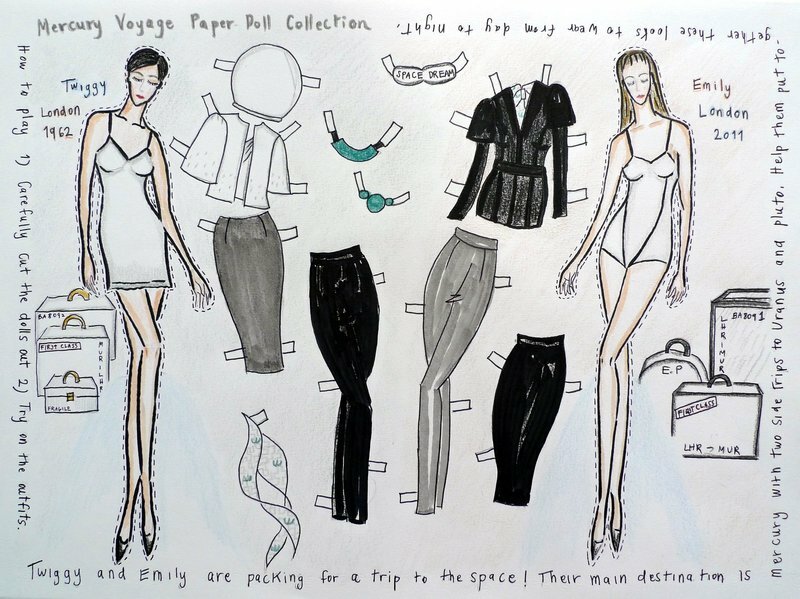 The assignment in his “Collections 1” class was to create a fall collection of six looks that were strongly influenced by 1960s silhouettes and futurism and based on an astrological theme – the planet corresponding to your sign. For the midterms, Tawn needed to share a mood board, technical drawings, illustrations, and a sketch book. What follows are a look at the mood board, illustrations, and the six outfits. The sketch book, not shown here, is a tool the designer uses to capture ideas and inspirations as he or she goes about daily activities. 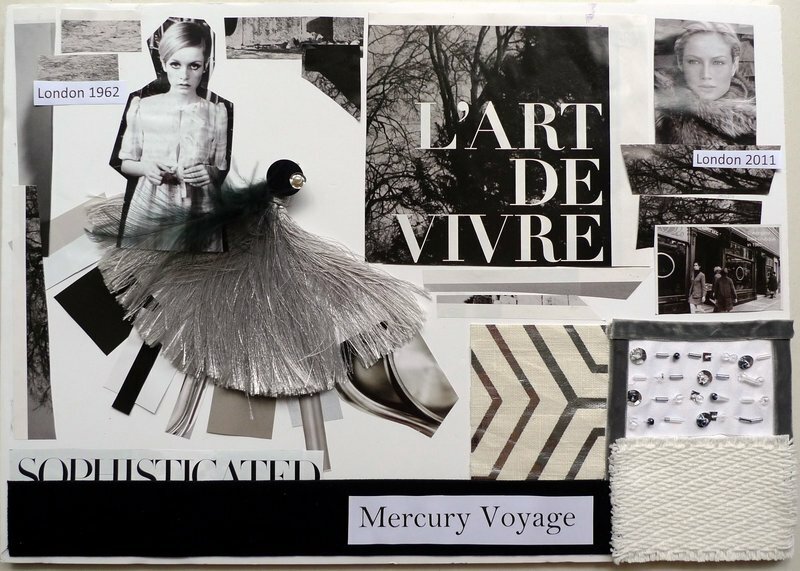 That gets translated into a mood board, the purpose of which is to communicate colors, pictures, fabrics, textures that will inform the collection. Tawn’s sign is associated with the planet Mercury, and as he viewed the planet he was inspired to look at “futuristic” as it was seen during the 1960s. His influences included the famous model Twiggy, fabrics in neutrals such as black and white, with soft touches from tassels, silk, and feathers. 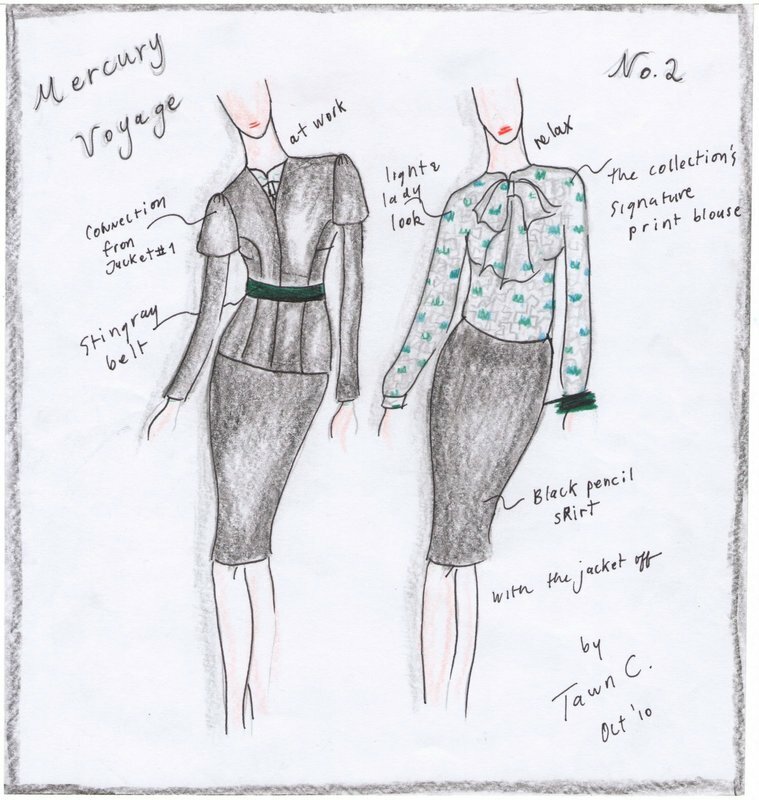 This is the illustration that shows the overall theme of the collection. You can see there are a variety of jackets, blouses, and an evening dress. The purpose of the illustration is to communicate the larger vision of the project in a more concrete way. As part of the project, he had to identify who he was designing for. Who is the woman who would buy his clothes? This was easy for him to understand because as a public relations professional, he is used to defining target audiences for his clients’ campaigns. In this case, the target woman was an urban professional in her 30s living in London. 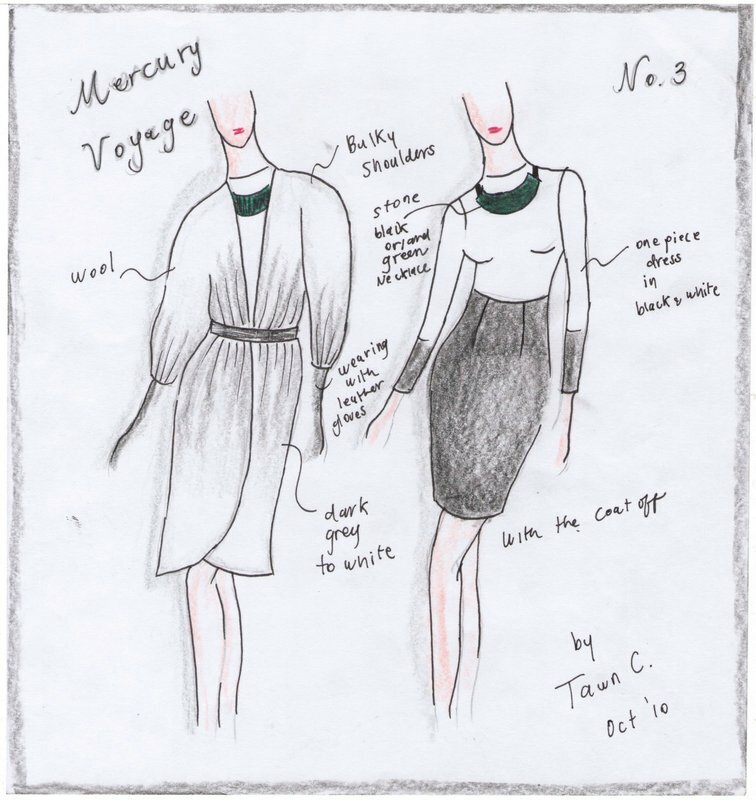 Since a collection should tell a story, Tawn created an imaginary story of two women taking a voyage to Mercury with side trips to Uranus and Pluto. 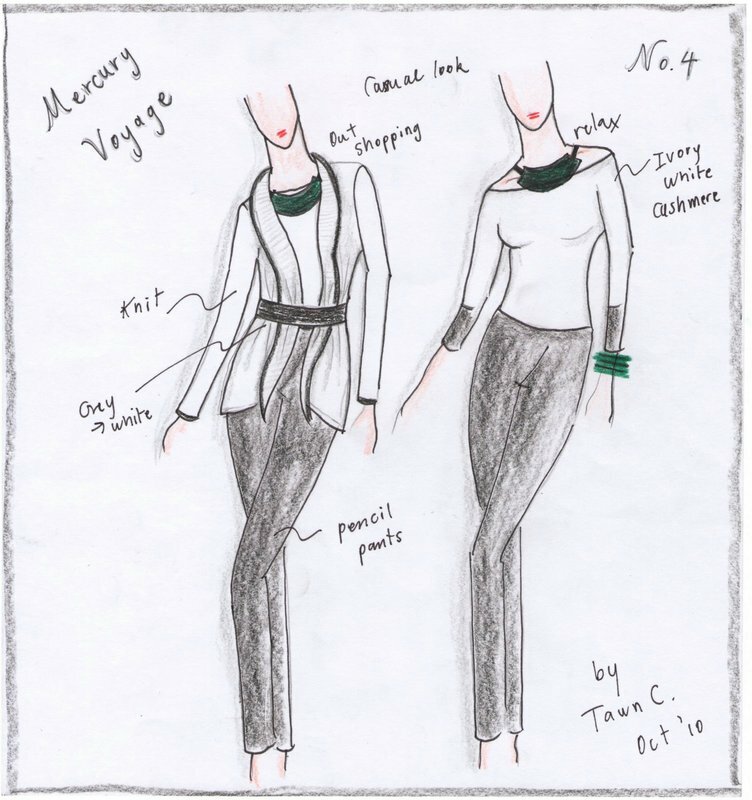 These were analogies to the experiences his target customer would have – working a long day in an office and then having to go out for dinner or a night on the town, wearing outfits that could effortlessly be adapted to the different environments. 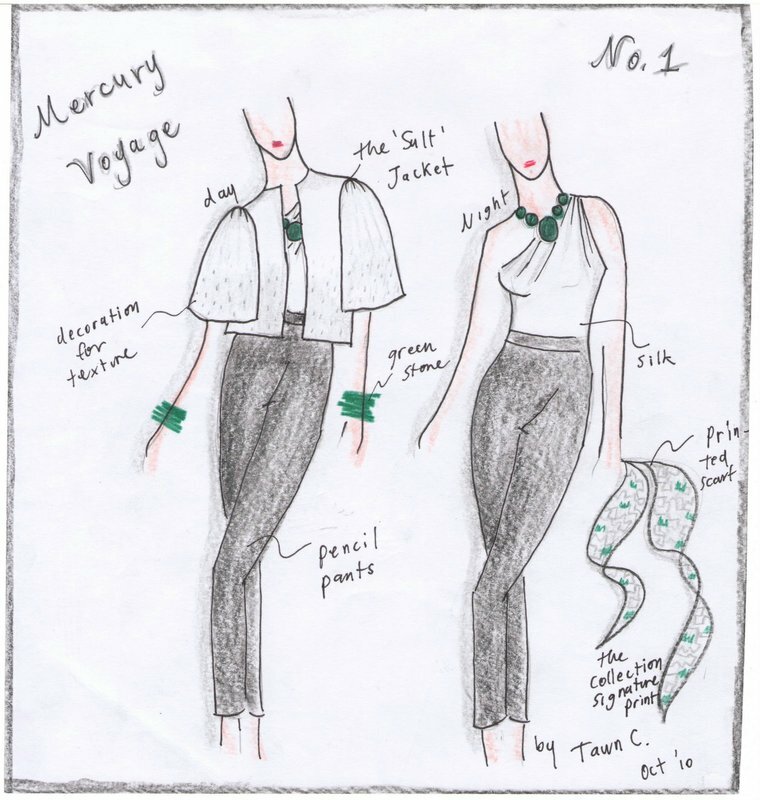 Outfit Number One – This is the outfit that Twiggy would wear while traveling to Mercury. The pencil pants provide comfort while the jacket provides structure. The key piece is the bell-sleeved jacked with a texture that is similar to coarse salt to add visual interest. The one-shoulder blouse provides a modern look and glamor that is revealed when the jacket is removed. The scarf has a signature print that appears throughout the collection, suggestive of the hidden life that may lie underneath Mercury’s cold and dry exterior. Outfit Number Two – For women who have to go out to work and meetings, they need something that looks elegant and formal – clean cut lines with a black jacket and pencil skirt. The blouse, done in the signature print, is very 60s secretarial with a feminine bow. The jacket sleeves, while smaller than the ones on the first outfit, still have a distinctive bell shape. The look is accessorised with a dark green stingray belt and dark green jade bracelets. Outfit Number Three – The bell shape theme continues but expands to the entire shoulder of a wool jacket gathering in pleats around the waist. It is a gradient from white to light gray around the waist and then back to white at the hem. The one-piece dress underneath is a comfortable but well structured Cashmere wool with a three-quarter length sleeve. The accessory is a dark green jade breastplate necklace. Outfit Number Four – The look becomes more relaxed, something she would wear for Sunday brunch before heading out to an afternoon excursion. The knit sweater has a shawl-like collar, bulky and comfortable. The top is similar to the one-piece dress in the previous outfit but with a wide collar that shows the tops of the shoulders. Outfit Number Five – This is the transition to evening wear, a cocktail dress that sees the one-shoulder dress return with an integrated single-sleeve mesh blouse. 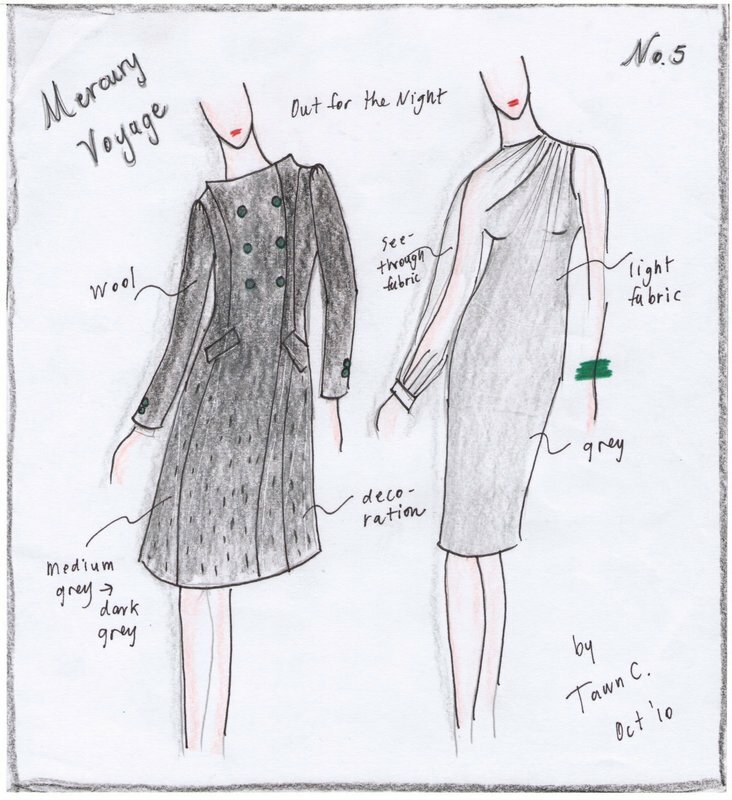 The wool jacket is inspired by Jackie O, lined with silk and decorated with the salt texture but done in medium to dark gray. 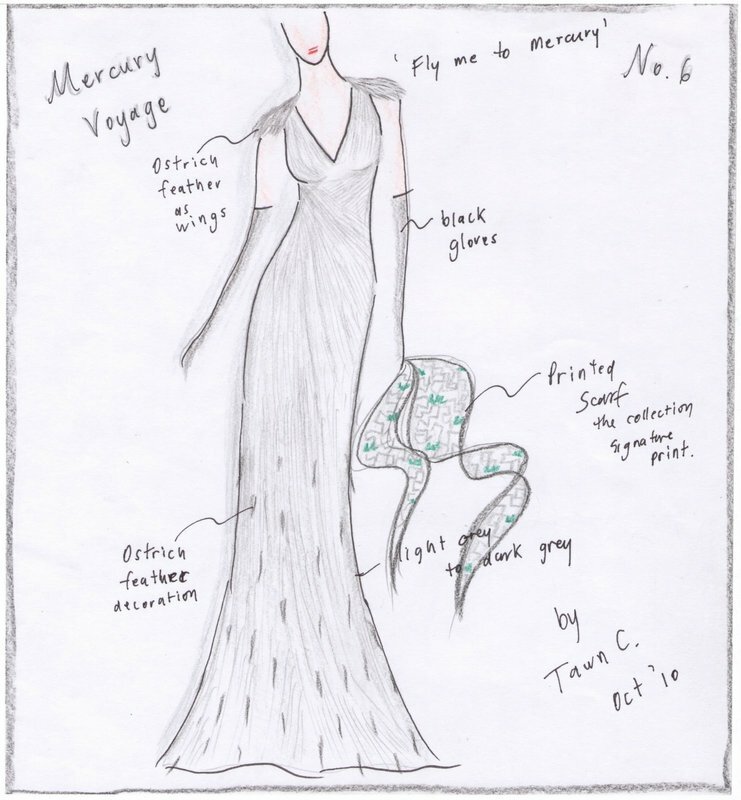 Outfit Number Six – The final look is a formal evening dress, called “Fly Me to Mercury”. Decorated with ostrich feather epaulets as well as ostrich feathers on the lower portion of the skirt, this dress is elegant with small pleats on the torso that spread out to follow the silhouette of the body. Long gloves and the signature print scarf complete the look. The final two illustrations were additional graphics Tawn created to present to his class. 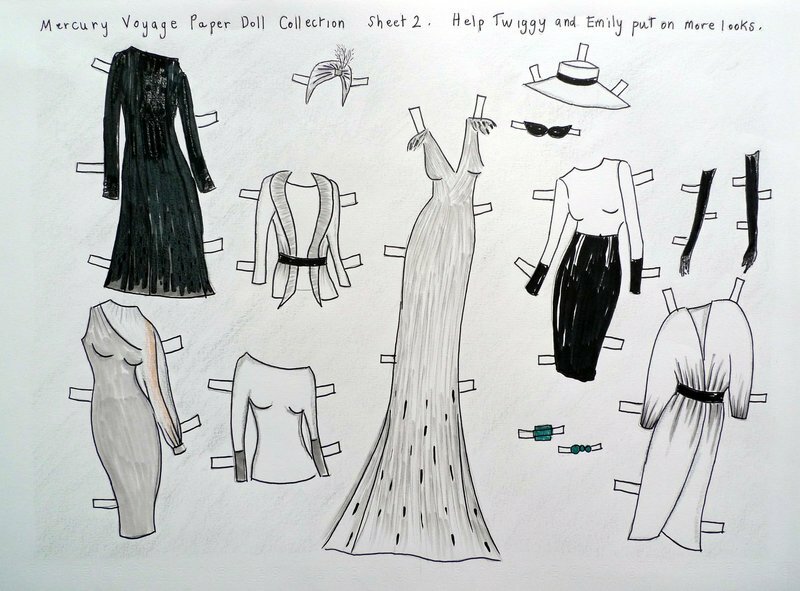 He wanted to convey the collection in a lighthearted way, playing off the idea of paper dolls from the 1960s. 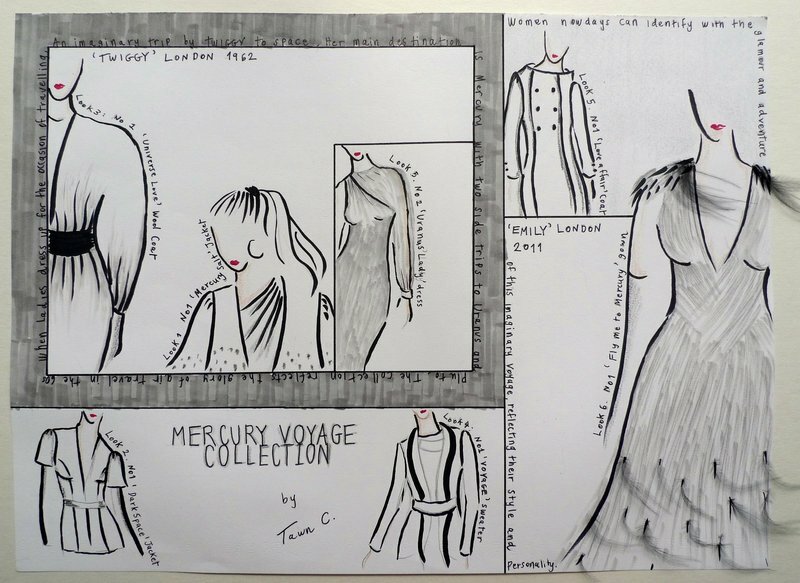 The story is of his muses, Twiggy and Emily, taking a voyage to Mercury. He could see this concept being used in a magazine photo shoot, a whimsical way to present the collection. So that is what Tawn has been up to. Now, if we can scrape up $2,000 or so, he could actually make prototypes of these outfits. Well, we’ll wait until his pattern-making class is complete! This entry was posted in Uncategorized and tagged Collection, Design, Fashion, Mercury, Tawn, Voyage by christao408. Bookmark the permalink. LOVE, love, love #4. So much. Is $2,000 a conservative number? Wow, they’re so cool! The one dress with the single long sleeve is really nice.Thanks for sharing! Tawn is vert talented. Wonder who will model these outfits? Love the “salt jacket”!!! =) Nice work Tawn! I used to fantasize about fashion design as a kid as I made my own clothes for my Barbie dolls, but then I realized that sketching was a huge part of it and I don’t think I can sketch clothes for the life of me even though I have visions in my head. Lovely outfits and the cost is reasonable. Great work Twan! Nice! Tawn has been very busy!! As I was looking through these “slides”, I remember vividly the last two, when I used to play “dress up” as a kid, cutting up from ready-made samples like these two slides, and placing the little tabs on top of a paper model. Well, now I can tell is that Tawn’s ‘haute couture’ is in the making! O O O please tell me Tawn’s gonna be on Project Runway!!!!!!!!! Wonderful! Love the paper dolls! I really like the one-shoulder cocktail dress and the feathered evening gown. If Tawn would like my measurements for when he takes his pattern-making class, just let me know. I’m pretty sure they are nowhere near Twiggy’s measurements though. How do these designs translate to “real” bodies, I wonder? Nice job, though, Tawn. I enjoyed seeing the thought/design process. Thanks for being willing to share. Seeing is worth a thousand words. @Roadlesstaken – Depends if you are a Republican or not. Ha ha… seriously, yes, it is a conservative number. Could probably make the outfits for closer to $1500 but would be unlikely to be able to accessorize them with that budget. @yang1815 – He probably needs to learn to sew before he is on Project Runway! @Finity – @puella_sapiens216 – @Fatcat723 – Glad you enjoyed the designs. I’m very proud of his work, as you can tell. @onmovement – @lil_squirrel4ever – Well, if it is an interest you have, you can always follow it. Tawn is having to learn to sew and had to start with a life drawing class before before he could move onto anything else. But if you have a passion for something, that provides the motivation to learn the basic skills you need. (Of course, Jason, I say the same thing about songwriting but I guess I shouldn’t have stopped my piano lessons at sixth grade…)@alextebow – @stevew918 – Tawn has talked about making some of these outfits either for his mother or one of his girlfriends here in Thailand, just so he can get some practice with making patterns and sewing. @jandsschultz – Oh, they probably translate about as well as any fashion designs do. All of the rest of us with normal bodies see the trickle-down version in the Lands End catalog! Ha ha…@murisopsis – Yes, he has been very busy. The “Annex”, our second condo unit adjacent to the living space, has been turned from just being the TV room and my office into a mini sweatshop with a sewing machine and a headless dress form looking over my shoulder. @CurryPuffy – Tawn’s cousin’s daugher saw this and wants her mother to print up the pictures so she can cut out the dolls and play with them. @christao408 – Will the students learn how to sew too??? I see there’s pattern-making coming up! To continue the space analogy, I’m over the moon in love with the jacket on No. 2. That would be so fantastic to wear to work. I also love the chunky green necklace on No. 4. Go Tawn! He is very talented! Amazing work!! I love outfit #3. Oh very nice… now I can understand what you meant when you said Tawn had to sit down and explain a few things. Thanks for posting this and pls pass along a thanks to Tawn too for allowing his work to be shown. @yang1815 – Good question. I don’t think there is a class specifically in that. The expectation is that you will learn the basics elsewhere. But I may be wrong. @TheCheshireGrins – @gasdoc73 – Thanks for your kind words. I’m very proud of his talent. Meg, that necklace in #4 is very interesting, isn’t it? @ElusiveWords – And when we sat down he would start running on and on so quickly that I couldn’t digest it and translate it into relatively clear everyday English. Many of us to not speak Fashionish. I’ll be sure to pass along your nice words, Matt. @christao408 – Any possibility Tawn would learn how to sew?Also, do they teach construction at all right now? Or the use of different fabrics?